– John Buchanan, an independent scholar, will talk about Griffin’s writings on life after death. – Philip Clayton, the dean of Claremont School of Theology and provost of Claremont Lincoln University, will address Griffin’s views on religion and scientific naturalism. – John Cobb, emeritus professor of theology at Claremont School of Theology and Claremont Graduate University and founding director of the Center for Process Studies, will address Griffin’s writings on evolution. – Daniel Dombrowski, professor of philosophy at Seattle University, will talk about Griffin’s treatment of the mind-body relation. 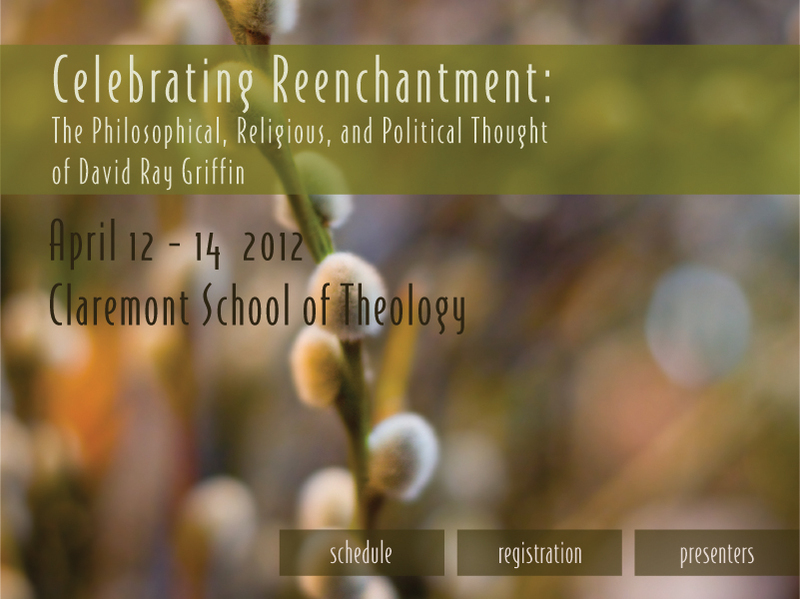 – Gary Dorrien, professor of social ethics at Union Theological Seminary and professor of religion at Columbia University, will discuss Griffin’s process theology. – Richard Falk, professor emeritus of international law at Princeton University and professor of global and international studies at the University of California-Santa Barbara, will discuss Griffin on postmodern politics and spirituality. – Tod Fletcher, former professor of environmental science at the University of California-Berkeley, will discuss Griffin’s writings about 9/11 and the 9/11 Truth Movement. – Marcus Ford, former professor of humanities at Northern Arizona University, will deal with Griffin’s treatment of parapsychology. – Nancy Frankenberry, professor of religion at Dartmouth College, will address Griffin’s treatment of religious experience. – Catherine Keller, professor of theology at Drew University’s theological and graduate schools, will discuss Griffin’s treatment of the problem of evil. – Sandra Lubarsky, professor and director of the Sustainable Development Program at Appalachian State University, will address Griffin’s writings on religious pluralism. – Gene Reeves, distinguished professor at Renmin University (in China) will speak on Griffin’s treatment of morality. – Peter Dale Scott, professor emeritus of English University of California-Berkeley, will address Griffin on 9/11, deep politics, and spirituality. Each talk will be followed by comments from Griffin and then discussion among the participants. At the banquet on Saturday evening, Griffin — professor emeritus of philosophy of religion at Claremont School of Theology and Claremont Graduate University and a director of the Center for Process Studies, will speak about his own intellectual journey. For information, see “Celebrating Reenchantment” (www.ctr4process.org/news-events/conferences/Celebrating_Reenchantment).